The imprint is called "Body By Victoria", so it's not a plural. The possessive is awkward, but correct. *YOU* might want to consider hiring a researcher. I understand that VS has a line called "Body By Victoria," but how is this ad supposed to be showing possession? Does the bra own something? It still doesn't make sense. Really? Can you really not understand it or are you being deliberately obtuse to make it look like you didn't crap the bed on this one? "The bra" doesn't own something, the imprint does. If I said "Body By Victoria's new line" you would know what I meant. If I abbreviated it it to "Body's new line", you would still know what I meant. Likewise, if I said "You've never seen Body By Victoria's bras like this!" you'd get it, even if I abbreviated it to "Body's", even if I awkwardly left out the word "bras". In other words, you know what they meant, you spazzed on this one. 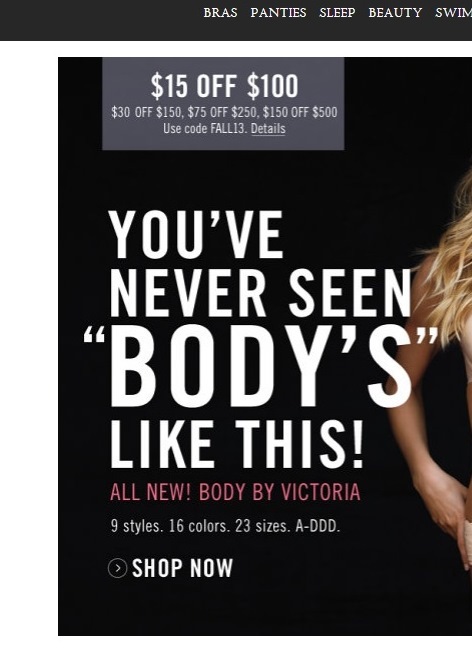 I understand that they are trying to shorten "Body by Victoria" to "Body." But you don't add an apostrophe to make something plural. They are not using the apostrophe to show possession; they are using it to make the word "Body" plural. What if it were "Pink" (another imprint) instead? The word "Body" should be treated the same as "Pink," even though "Body" ends with a vowel. In other words, if this ad were for Pink, it should read "You've Never Seen PINKS like this." You would not write, "You've Never Seen PINK'S Like This." The apostrophe in the name of the imprint is wrong. This is indeed jarring, but arguably close enough to correct to let it go. The word "body's" is in quote to suggest the double entendre, "You've never seen bodies like these". The word "body's" is not possessive, it is plural. It refers to the Body by Victoria products in the ad. They can't say "Bodies" because that's not their trademark. They can't say "Bodys" because that's completely incorrect. "Body's" is a compromise that lets them make the tortured play on words. It could be argued that the apostrophe stands in place of the missing "ie". That argument would be as tenuous as the wordplay in the ad, but it would be an argument. The real problem here is using such convoluted language to say something only mildly witty. The agency would've been wise to heed the warning that using humor in ads is a risky proposition. It needs to be obviously funny or clever to be effective. This is neither. I read and reread this ad when I got the catalog in the mail. It is correct, just a weird product line name used in an incredibly awkward construction. So while not grammatical error, it IS a marketing failure.